Parents of girls beware. During your Walt Disney World vacation, you may discover that your daughter has a heretofore unknown skill, hair wrap radar: the ability to spot a hair wrap stand from a hundred yards away. Here are some pointers to help you cope with her new found talent. Um, what’s a “hair wrap”? It’s an embellishment for your hair. A stylist wraps colorful string (like embroidery floss) around a small section of hair. 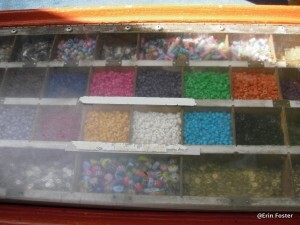 Usually guests can choose three or four colors from about a dozen choices. Beads may be added for extra flair. Where are the hair wrap stands located? 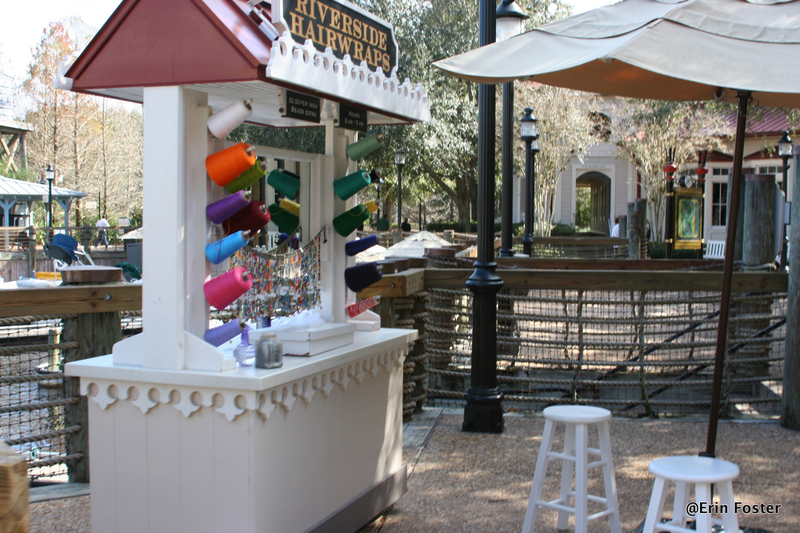 Hair wrap stands are poolside at many of the resorts including Wilderness Lodge, Beach Club, Grand Floridian, Caribbean Beach and Port Orleans. There are also wrap stands on the Boardwalk, at Downtown Disney, and in the Animal Kingdom near the entrance to Camp Mickey Minnie. In my experience, these stands come and go with some regularity. 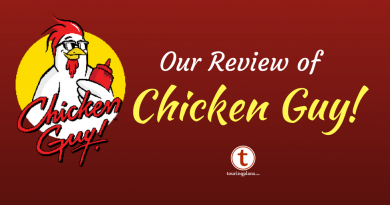 You may find these locations temporarily shuttered or that others have popped up in different locations. If you’re trying to find one, stop by the concierge desk at your resort and they can call to confirm locations before you make a special trip somewhere. Is there an age requirement for hair wrapping? No. Your child must be able to sit still on a stool while the wrap is being applied, but otherwise there are no age restrictions. This may make it a good alternative treat for guests who are too young or too old for the Bibbidi Bobbidi Boutique. The BBB will only serve guests ages 3-12. My own daughters had this done several times when they were two years old. Hair wrap pricing is by the inch. Prices can change, but currently the cost is $2.00 per inch of wrap, plus the cost of beads. Beads range in price from about ten cents for a small silver “spacer” to several dollars for an intricate bead with an image on it. A typical price for a child with shoulder-length hair would be about $25. However, with long hair, or a taste for expensive beads, the cost could end up being more than double that. Get an estimate before you begin. This depends a bit on the skill of your stylist, but most shoulder length wraps take about 15-20 minutes to complete. The longer the hair, the longer the wrap will take. My child has short hair. Can she get a hair wrap? No problem. The stylists can work with almost any length hair. If the guest has shorter hair, the stylist will start the wrap on the actual hair, but continue wrapping string on string, making it look like the hair is longer. In my experience, a good stylist can make a wrap that will last for many weeks. My three daughters have all had Disney hair wraps that lasted three weeks and survived many swims and washings. The wraps may last even longer, but my girls have always asked me to removed them at the two or three week mark. I think they start to feel itchy after a while. How do I get it out? This has always been a challenge for me. If you don’t want to cut out a chunk of the child’s hair, you have to go very slowly snipping knots with a tiny pair of nail scissors. I have resorted to putting the kids in front of a movie while I slowly snipped and unwound the wrap. If you don’t think that your child will sit still for this, you may want to ask the stylist to make the wrap on an underlayer strand of hair. This way, if you end up having to cut off the wrap, the visual impact will be minimal. Is there any way to reduce the time spent putting in or taking out the wrap? If your child wants the hair wrap effect, but doesn’t want to sit still, there are pre-made clip-on wraps available at some of the stands. Pricing varies depending on the size/complexity of the clip wrap. What happens if I have more than one child that wants a wrap? Some hair wrap stands, notably the ones at the resort pools, only have one stylist available at a time. If more than one guest wants a wrap, there is usually a sign-in list and guests are served on a first-come, first-served basis. If you sign-in, be aware of potential wait times. For example, if you’ve got three people ahead of you, this could mean an hour long wait. Also, if you have more than one child who wants a hair wrap, you may need to factor lots of waiting around time into your schedule. A few of the stands, particularly the one at the Animal Kingdom, have more than one stylist on duty at a time. This may reduce waits. What are the wrap stand hours? This varies by location and season, but the stands typically only operate during the day. For example, you might encounter a poolside stand with 11:00 a.m. to 5:00 p.m. hours. Double check at the concierge desk for the schedule at the time of your visit. Also be aware that since the stands are located outdoors, they may be temporarily shut down during adverse weather conditions. Will they wrap boys’ hair? Yep. While not many boys opt to have their hair wrapped, I have seen a few younger boys with these embellishments. 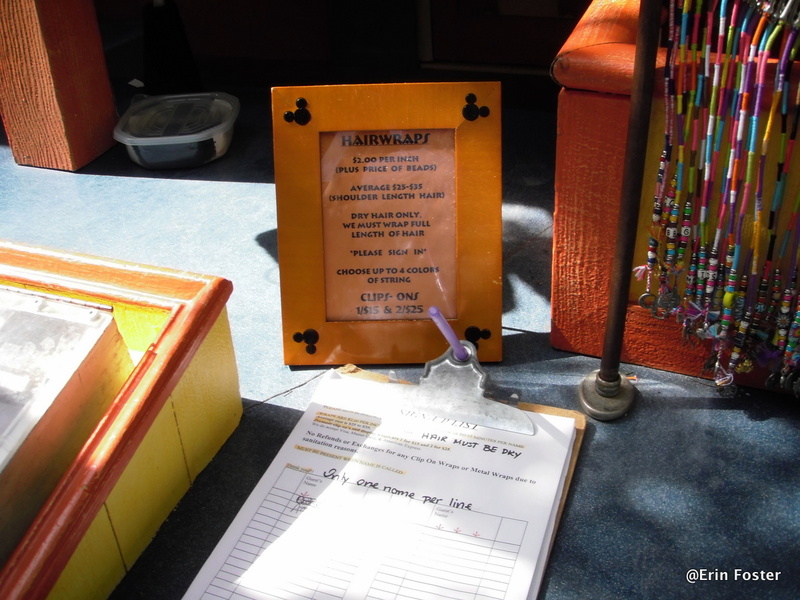 Beyond the daily sign-in sheets mentioned above, reservations are not accepted. Will the hair wrap stands braid hair? No. The only places at Walt Disney World that will braid hair are the salons at the deluxe resorts. Call for availability and pricing. 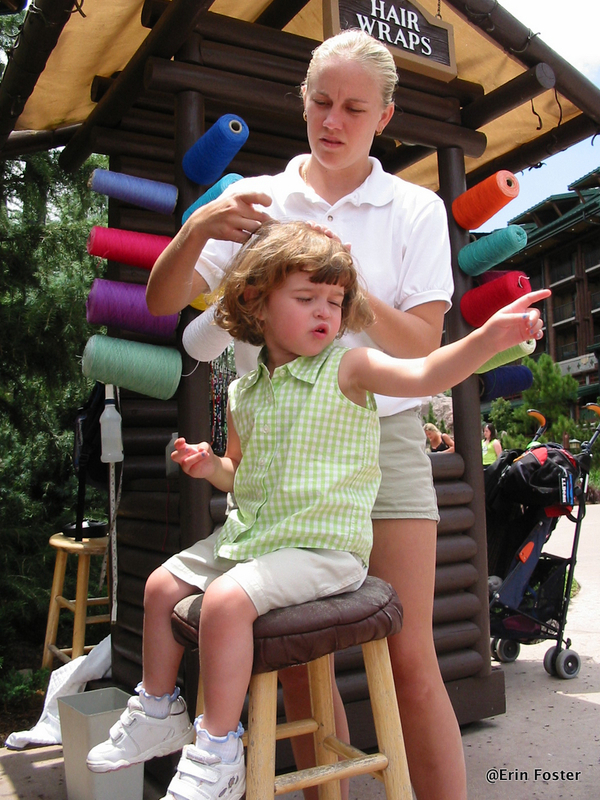 Reservations are recommended for hair braiding at the salons. Am I supposed to tip the stylist? You can. The hair wrap stylists are subcontractors, not full Disney employees. They are allowed to accept gratuities. A tip of 15-20% would surely be appreciated. Have you ever had your daughter’s hair wrapped? Or your hair wrapped? Were you satisfied with the results? Did it last as long as you wanted it to? 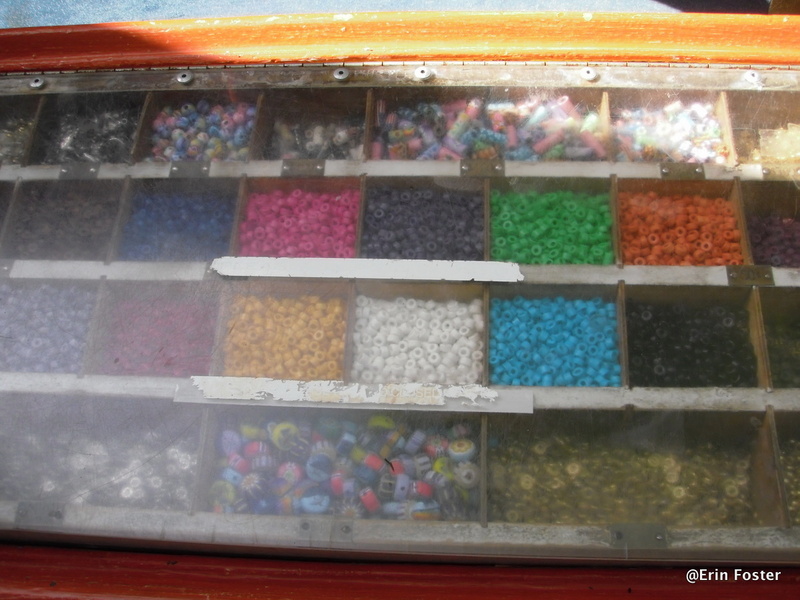 Do you have any advice for saying “no” to the siren song of the colorful beads? Let us know in the comments below. Julia’s Best Week Ever, June 2, 2016: Aloha! June 2, 2016 Julia Mascardo Comments Off on Julia’s Best Week Ever, June 2, 2016: Aloha! My daughter had this done when she was 14. It lasted for many weeks. We had them place it in an under layer and when she wanted it out we simply cut it. She has curly hair and no one could tell. She then took a clip, put it on top where her hair could be seen and made it into a book mark. She is now 19. I have no idea where it is, but if we went through all her nicknacks and souveniers, I’m sure we would find it. My 3yr old daughter got a wrap this summer at the stand outside Pirates of the Caribbean- she loved it! It lasted about 3 weeks after we got home. So cute! We had it put in on an under layer of hair so it was easy to cut out & not miss where it had been. My only complaint was that they didn’t offer any Disney themed beads- only suns, moons, peace signs & sea turtles. Would be great to have a Mickey bead, Princess or even a crown! Good point. I too have wondered why there are no Disney beads at the stands. Hmmm. That’s great that the stand fixed a negative situation. And good strategy with splitting the cost of beads with your daughter. Those can really add up fast. 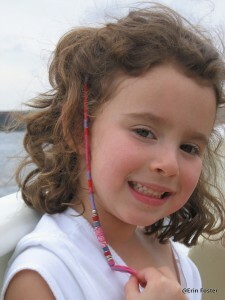 I’m not a fan of the hair wraps any more than I am of the braids you can get while on DCL. But I let my 8 yr old get a wrap last year when we went. She liked it, it was neatly done, and easy to remove. BUT…..beware…the longer they make that wrap, the more expensive it is!! And the beads and embelishments add up quickly. Thank you for the article on this.. nice timing! My 7 year old asked if she could have this done today….. we are staying at POP – but will look for the stand at the Animal Kingdom! I’m so glad I’m not the only one with a daughter who is obsessed with hair wraps. 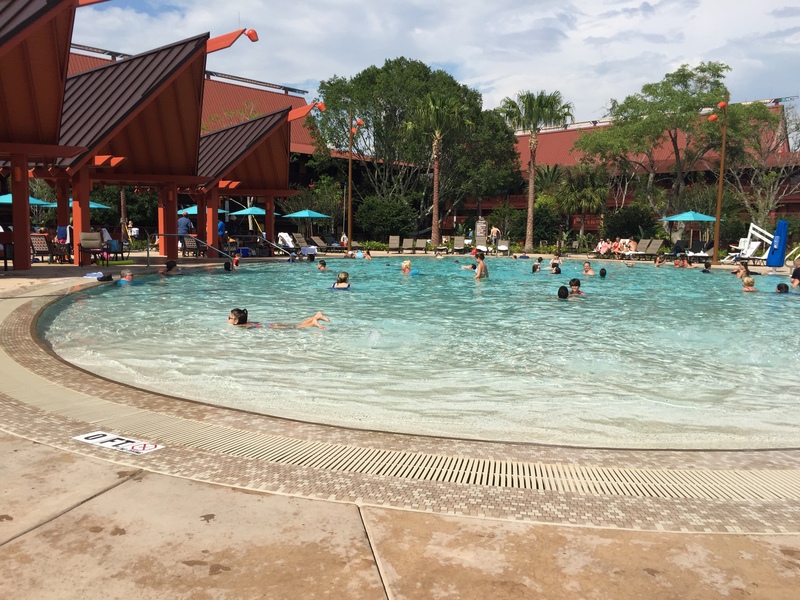 We went to WDW in August and stayed at the Beach Club. DD5 saw a hair wrap stand and, seriously, that is the only thing she could focus on. We spent the last two days of our vacation at Disney’s Vero Beach Resort, so we told her that she could get it done when we got there (that way, we weren’t wasting valuable Stormalong Bay and park touring time). I kid you not, every day, she asked, “How many days until Vero Beach?” I think it was the highlight of her entire vacation! We definitely had a few vacations where hair wraps were the highlight of the trip for my girls. I begged my mom to get me one in the late 90’s it was at the Port Orleans Hotel. I remember it came with the whimsical beads and charms. She got a matching one. I took very good care of it for an 8 year old and it lasted well over 6 months. I still have it at the ripe old age of 22. We plan on going again this summer, and we are likely to repeat the tradition. We just had a great week at POR. I am 42 and got a hair wrap. The stylist told me that usually adults get theirs on an under layer back behind an ear. So, I did that, and I really like it. I am a 2nd grade teacher, so I don’t think it makes me stand out. Of course, it is a big hit with my second grade girls. 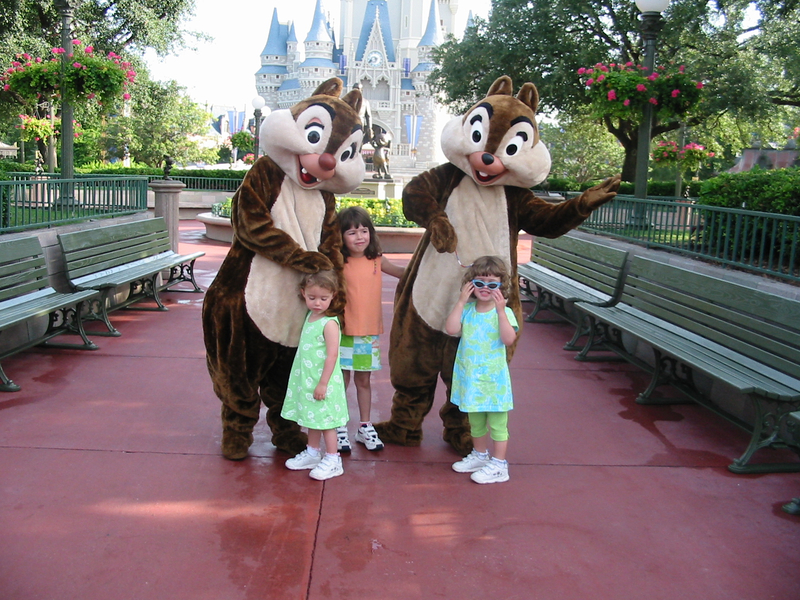 I got my shoulder length hair wrapped when I was 10 at Walt Disney World. I am 21 now. My mom only let me get it as long as I kept it in for 6 weeks at least. It lasted a whole year! I loved it and have not be able to find a place beside Disney World that does this. This Christmas I’m going back with my sister and her kids, her daughter will be 11 and we plan on getting matching ones! Hi I’m Reese and I’m 11. I am going threw that phase with the hair warping and I went to the craft store to get thred for making friendship bracelets( another phase ) when I got there I realised that you could get the material for 37¢ and they had tuns of colors. I made one and it looks like I got it done from a pro except guess what, I did it myself! It was so cheep and fun. I love it and so would other kids. If you learn to wrap the hair or do the Chinese staircase then that might make it look better. You are absolutely correct that the supplies for hair wrapping can be found at many craft stores at a very low cost. I admire your skill and creativity to do this yourself.